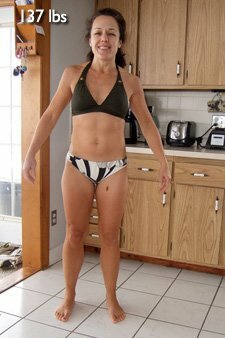 Dennette Shed 15 Pounds, Nearly Half Her Body Fat, And Competed On Stage. Dennette was tired of not being able to lose stubborn post baby weight so she changed her routine and started a new fitness journey. See how she transformed her body and competed in figure! I was looking for a new challenge. I believe you should always be looking for new and different ways to recreate and define yourself. I had always been athletic in high school and worked out on and off for many years, but it was after having my twins 7 years ago that the baby weight wasn&apos;t coming off. I would lose 5 pounds and then gain it back again. I was tired of my clothes always feeling snug and having a lack of energy. I never really knew much about weightlifting or diet and nutrition. I would eat relatively healthy but snacked a lot. With kids you always find yourself eating your meal and their leftovers. A friend had told me more than once that I had great delts and that I should enter a figure competition. I was like no way I am too old and I don&apos;t have the time or the money to invest in that. After much debate and talking and thinking about it, she introduced me to a trainer, Kim Audette and from then on I was hooked. I knew that this is what was going to get me to the next level in my fitness. I love the feeling of lifting heavy and feeling strong. I always want to be a good example of health and fitness for my family and friends. I Love The Feeling Of Lifting Heavy And Feeling Strong. First and foremost you need a great support system and my husband and family were a great support. I could not have done it with out them. After I met my trainer in Feb 2010 we came up with a plan of entering a figure competition in the summer of 2010. She put me on a diet and I trained with her 2 times per week and 3 days on my own. I began to eat small portions of lean protein and vegetables every 3 hours and drank a gallon of water. I never really knew the importance of eating several small meals a day to maintain a high metabolism. I subscribed to Oxygen magazine and found a ton of exercise routines and recipes. Also, Tosca Reno&apos;s books are great on eating clean. Once I started to see results, I was hooked. We were looking into competitions to enter, but all the summer dates were already booked with other commitments so the only one to enter was in April. YIKES! I had two months to get it all together. She had confidence that I could do it so we went ahead with it, full steam ahead. I told her I don&apos;t care if I win or not I just want to look like I belong up there. I didn&apos;t end up with a trophy but I did place in the top 10 in all 5 events I entered and I didn&apos;t look half bad. After that I had been bitten by the competition bug and went back to the gym and trained harder and built more muscle and worked on my posing. Then I entered two more competitions in Oct 2010. On Oct 9th (my 43rd birthday) I brought home a trophy for 5th place in novice. It was the best birthday present ever, my parents had even flown out from CA to see me. On Oct 30th, in my other competition, I placed 4th in open and 5th in Masters. I loved the fact that my trainer always knew I could lift more than I thought I could. I Could Lift More Than I Thought I Could. On the days that I don&apos;t do a cardio machine I will do 8 sets of 30 sec plyometrics in between my weightlifting sets. 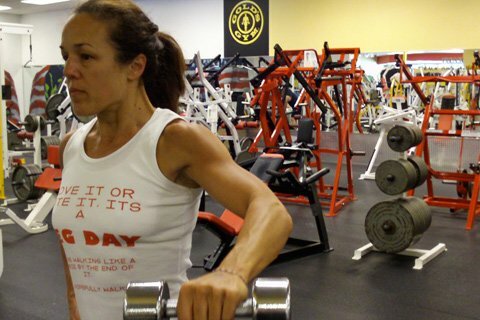 I&apos;m always changing my workouts to keep my muscles guessing and to keep my workouts interesting and challenging. Work smarter not harder! Don&apos;t let age be a deciding factor. As long as you are able to get up and go, get up and do it! Set a goal and focus on the prize. Average is no longer an option and age is all but a number! Believe in yourself! 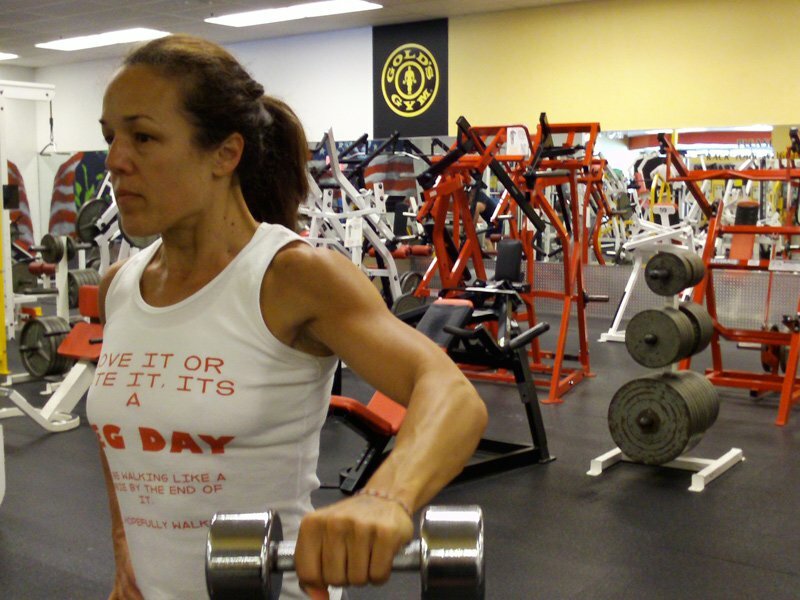 As women grow older, weight training is even more important to strengthen your bones and maintain a healthy lifestyle. If an ordinary 43-year-old housewife can do so can you! I love to inspire woman to achieve their health and fitness goals. I would advise anyone thinking about entering any kind of body building event to hire a trainer. They push you beyond what you think you are capable of. It&apos;s a great feeling to have someone tell you that you have motivated them to live a healthier life. We are all here to help each other and I am proud to be able to help others. I proved to myself that I could do what I set out to do. It wasn&apos;t easy, but it certainly wasn&apos;t as difficult as I thought it was going to be. You will find that as you go through your journey, you will set a good example for others to follow. I firmly believe that I have to take care of myself in order to take care of my family so working out was for them as well as for me. Your healthy lifestyle will give them the tools they need to live long and healthy lives.